Movie lovers and Metro riders can rejoice. 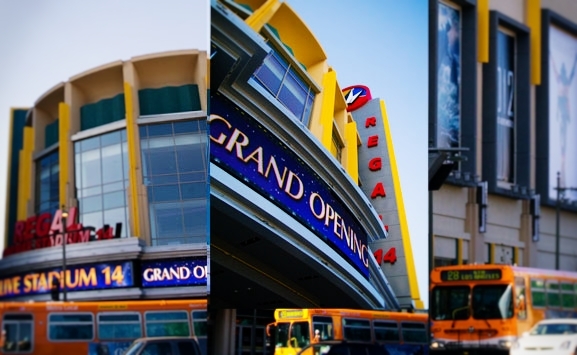 The new Regal Cinemas Stadium 14 at L.A. Live is served by three rail lines (soon to be four) and over 30 bus lines, making it far and away the most transit accessible place to catch a movie in the city. No other theater can compete, I checked. The much anticipated theater opened last week with the premiere of the Michael Jackson documentary This Is It playing on all 14 of its state-of-the-art screens. Located on the north side of the L.A. Live complex, the theater is situated within a 10-minute walk of three Metro Rail lines – the Blue Line at the Pico Station (future home of the Expo Line), and the Red and Purple Lines at 7th Street Metro Center Station. Metro Line 28, which comes from Century City through Koreatown on Olympic Boulevard, has a stop directly in front of the theater. The 28’s Rapid sister, Metro Line 728, stops a few blocks away at Olympic and Figueroa. Thirty other Metro Lines (which I’ll list at the end of this post), plus Downtown DASH service, and service from municipal operators, stop within a half-mile walk of the theaters. With the closing of downtown’s Laemmle Grand 4-Plex, the nearest competing multiplexes serving the area are two miles away: the MPark 4 in Koreatown (just off the Wilshire/Vermont Red/Purple Line Station) and the University Village 3 near USC. The MPark 4 plays Korean movies and mainstream American movies with Korean subtitles on its four screens and the University Village 3 has received less than stellar reviews on Yelp. L.A. Live’s Regal Cinemas, in addition to having 14 screens, is also outfitted with the latest cinema technology. According to the Downtown News, all screens feature digital projection and sound, and four of the screens are capable of projecting 3D films. So these new theaters should be a welcome addition to movie goers in the vicinity who are looking for more choices and whiz-bang for their buck without having to travel to Hollywood or The Grove. What’s more, the theaters are poised to bring some of those Hollywood movie goers downtown on the Red Line for premieres. The over-the-top apocalypse movie, 2012, will be premiering this Tuesday, November 3rd and many more are expected to follow. That means celebs, paparazzi, and the red carpet are all now Metro accessible from all corners of this industry town. In fact, for premiere nights I expect to see many eco-minded celebs hike down from their homes in the Hollywood Hills and take the Red Line down to the red carpet. Movie stars on Metro? I’m not gonna hold my breath. But for those of us without limos, the new Regal Cinemas at L.A. Live is (really) well served by the other long vehicles in this town: Metro buses and trains. Update: LAist and blogdowntown report that tonight Regal Cinemas at L.A. Live is offering free screenings to downtown residents. Downtowners will have first-come-first-serve access to seven summer movies and $1 popcorn and sodas. Downtowners who live beyond walking distance, this is your chance to hop on a bus or train and take advantage of this great offer. Tonights films: Funny People (7:00), 500 Days of Summer (7:10), District 9 (7:20), Star Trek (7:30), Up (7:40), G.I. Joe (7:50), The Proposal (8:00).